Joe Ingles is a confident man. Two weeks ago, the Utah Jazz guard doubled-down on what was perceived to be a joke after the Jazz’s preseason win over the Toronto Raptors, when called himself the best shooter in the league. “No, I am. Yeah, why wouldn’t I?” Ingles said. “The numbers I’ve shot, the percentages, they obviously are what they are and people are going to dissect everything but, I honestly feel like they’re all going to go in when I shoot the ball. 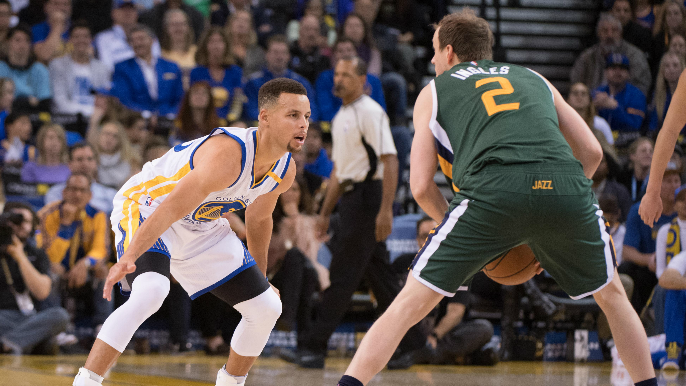 Stephen Curry, considered by many to be the greatest shooter of all time, was informed of Ingles’ comments at shootaround ahead of Golden State’s clash in Utah Friday night. “That just means in Las Vegas in the Summer League in 2009, we had two of the best shooters of all time on the same team,” Curry joked. “We got a lot in common. For what it’s worth, Ingles has shot a better percentage than Curry over the last two seasons, but while also averaging a combined 10 less attempts per game in those seasons. Ingles finished fourth in the NBA in 3-point percentage last season (44 percent, tied with Klay Thompson) while Curry finished 13th (42.3 percent). Curry also has the record for most made 3-pointers in a season, with 402 in 2015-16. He’s also second (324 in 2016-17), third (286 in 2014-15), and fourth (272 in 2012-13) on that list. The most 3s Joe Ingles has ever made in a season was 204 in 2017-18.